For graduate and undergraduate courses in computer science, computer engineering, and electrical engineering. 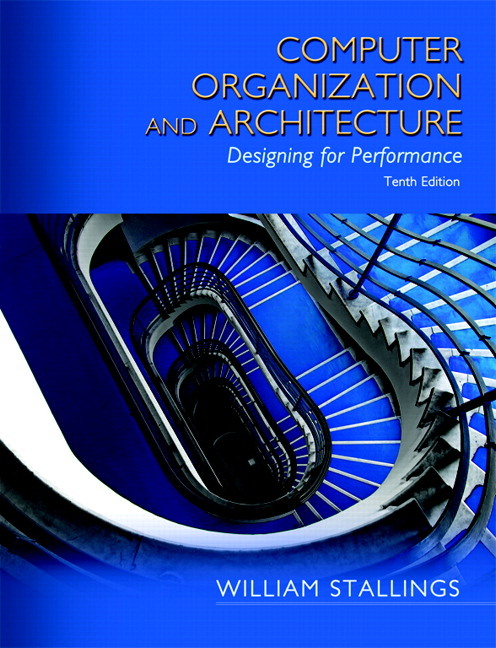 Computer Organization and Architecture, 11th Edition is about the structure and function of computers. Its purpose is to present, as clearly and completely as possible, the nature and characteristics of modern-day computer systems. 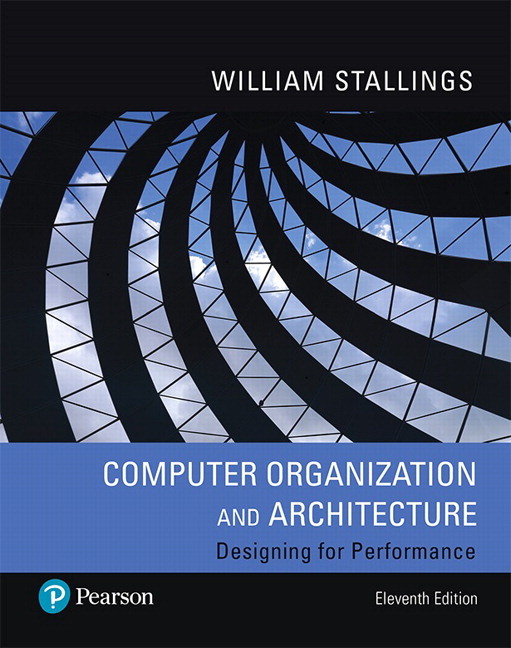 Written in a clear, concise, and engaging style, author William Stallings provides a thorough discussion of the fundamentals of computer organization and architecture and relates these to contemporary design issues. Subjects such as I/O functions and structures, RISC, and parallel processors are thoroughly explored alongside real-world examples that enhance the text and build student interest. 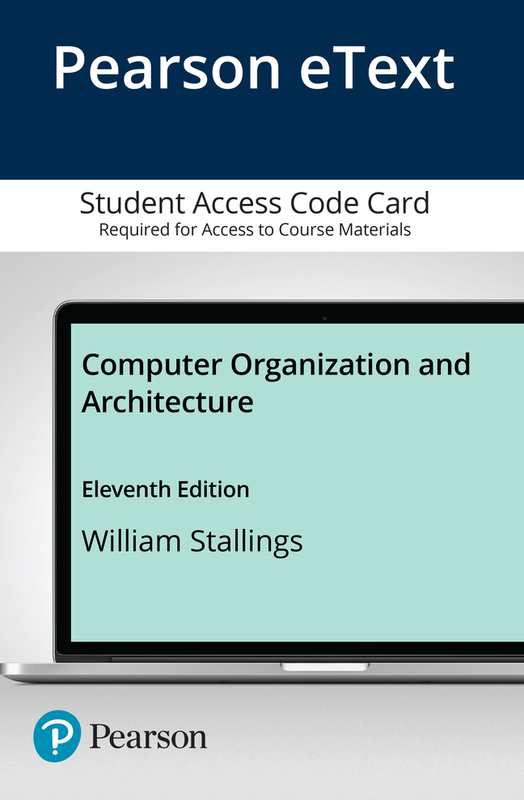 Incorporating brand-new material and strengthened pedagogy, the 11th Edition keeps students up to date with recent innovations and improvements in the field of computer organization and architecture. Pearson eText is a simple-to-use, mobile-optimized, personalized reading experience. It lets students highlight, take notes, and review key vocabulary all in one place, even when offline. Seamlessly integrated videos and other rich media engage students and give them access to the help they need, when they need it. Educators can easily schedule readings and share their own notes with students so they see the connection between their eText and what they learn in class – motivating them to keep reading, and keep learning. And, reading analytics offer insight into how students use the eText, helping educators tailor their instruction. Learn more about Pearson eText. Utilizes a top down approach–computer system, processor, control unit– for clarity and ease of use. The objective is to present the material in a fashion that keeps new material in a clear context. Systems are viewed from both the architectural and organizational structure perspectives to help students gain a comprehensive overview of computer design. A unified treatment of I/O provides a full understanding of I/O functions and structures, including discussions of DMA, direct cache access, and external interfaces. A focus on multicore gives students a broad understanding of this technology, found in virtually all contemporary machines. A thorough discussion of instruction sets, including a new chapter on assembly language. Detailed use of specific examples throughout the book to illustrate concepts, including Intel x86, ARM embedded system architecture, and IBM z13 mainframe. Homework problems, case studies, and additional student resources enhance their understanding of the material. Projects and other student exercises are richly supported with a variety of research, simulation, and assembly language projects that instructors can use to tailor a course plan. Over 20 interactive simulations illustrate computer architecture design issues, providing a powerful tool for understanding the complex design features of a modern computer system. New - A discussion of multichip modules (MCMs), has been added to Chapter 1. Updated - Updated treatment of SPEC benchmarks in Chapter 2 covers the new SPEC CPU2017 benchmark suite. New - A chapter on memory hierarchy expands on material that was in the cache memory chapter and adds expanded coverage of both the principle of locality and the memory hierarchy. Revised - The cache memory chapter (Chapter 5) now includes expanded treatment of logical cache organization, including new figures, to improve overall clarity. New - Coverage of content-addressable memory, write allocate, and no write allocate policies have been added to Chapter 5. New - A section on the increasingly popular Embedded DRAM, or eDRAM, is included in Chapter 6. Schedule readings to keep students on track: Instructors can create due dates for sections or chapters of their eText so that students know exactly what they need to read to come to class prepared. The mobile app also lets students set notifications to remind them of due dates. Help students focus on what they need to study: Students can make their Pearson eText their own by creating highlights with meaningful labels and notes. The customizable Notebook lets students easily filter, arrange, and group their notes in a way that makes sense to them. Gain insight into how students use their eText: Reading analytics let educators see how students work in their eText so that you can plan more effective instruction. Straightforward setup makes it incredibly easy for educators to get students up and running quickly on the first day of class. LMS integration provides institutions, instructors, and students with single sign-on access to your Pearson eText courses via Blackboard Learn™, Canvas™, Brightspace® by D2L, and Moodle™. A discussion of multichip modules (MCMs), has been added to Chapter 1. Updated treatment of SPEC benchmarks in Chapter 2 covers the new SPEC CPU2017 benchmark suite. A chapter on memory hierarchy expands on material that was in the cache memory chapter and adds expanded coverage of both the principle of locality and the memory hierarchy. The cache memory chapter (Chapter 5) now includes expanded treatment of logical cache organization, including new figures, to improve overall clarity. Coverage of content-addressable memory, write allocate, and no write allocate policies have been added to Chapter 5. A new section on the increasingly popular Embedded DRAM, or eDRAM, is included in Chapter 6. Dr. William Stallings has authored 18 textbooks and over 70 books on computer security, computer networking, and computer architecture. With over 30 years’ experience in the field, he has worked as a technical contributor, technical manager, and an executive at several high-technology firms. Currently, he is an independent consultant whose clients have included computer and networking manufacturers and customers, software development firms, and leading-edge government research institutions. He has received the award for the best computer science textbook of the year thirteen times from the Text and Academic Authors Association. Dr. Stallings created and maintains the Computer Science Student Resource Site at ComputerScienceStudent.com. This site provides documents and links on a variety of subjects of general interest to computer science students and professionals. He is a member of the editorial board of Cryptologia, a scholarly journal devoted to all aspects of cryptology. He holds a Ph.D. from MIT in computer science and a B.S. from Notre Dame in electrical engineering.